Apple has warned consumers against using third-party power adapters with their iOS devices as they can cause safety issues such as burns and electrocutions, but as it turns out, third-party chargers that have not been approved by Apple may also be responsible for causing damage to one of the chips in the iPhone 5. The U2 IC chip controls the charge to the battery, the sleep/wake button, some USB functions, and regulates the charging power to the power IC that actually charges the phone. 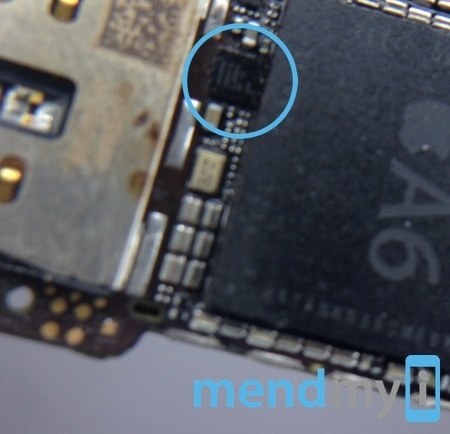 When damaged, the chip can fail to work properly, which prevents an iPhone 5 from turning back on. While a fresh replacement battery will power the iPhone, once the battery is depleted, the issue resurfaces. Mendmyi says that it has seen multiple iPhone 5 devices with a damaged U2 IC chip and has narrowed the problem down to third-party chargers and USB cables, which do not properly regulate voltage. The cause of this component becoming faulty is really quite simple -- third party chargers and USB leads! It is not clear if the issue is limited to the iPhone 5 as some users have also reported third-party charger issues with the iPhone 5c, which may use the same component, but the iPhone 5s and the iPhone 5 use different U2 IC components. Users with an iPhone 5 experiencing charging issues that have used a third-party cable may have damaged their devices, which will need to be repaired by Apple or another repair outlet. 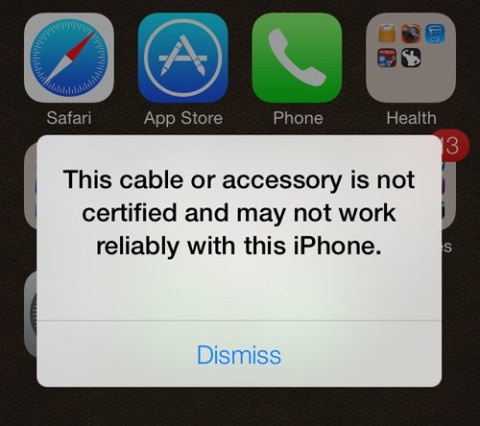 Apple has regularly recommended against using third-party chargers and cables. In mid-2013, the company even launched a third-party power adapter recycling program, following the electrocution of a Chinese woman allegedly caused by a counterfeit charger. Apple ran the recycling program from August to October of 2013, recycling counterfeit adapters and providing customers with a $10 credit towards an Apple-branded charger. As of iOS 7, Apple also warns customers when they are using unauthorized cables or accessories with their devices. The company's Lightning connector, introduced with the iPhone 5, fourth generation iPad, and original iPad mini, utilizes several different chips to manage dynamic pin assignment and to recognize whether connectors came from authorized channels. Apple's own chargers, as well as those that have been MFi certified, "undergo rigorous testing for safety and reliability," according to the company, and are designed to be safe and work properly with iOS devices. How long before people realise they should just buy Apple approved chargers etc, surely if they can afford the products they can afford an extra few dollars for the correct accessories! Two thoughts. One, where is the apple car charger? They don't make one. Two, where are the 6ft cables from apple? They don't make any. While they say that you shouldn't use anything but their chargers, the chargers themselves don't cover all the needs of where the device is used. I would happily buy their version of it was available but they aren't so I can't. In this case, trying to save a couple of bucks is just not worth the risk people. Please. I get that same warning on authentic Apple purchased cables and I've had to replace two of them. They are not as durable as the old connector. The MacRumors article doesn't make it clear, but I think when they say "third-party chargers" they're really referring to no-name Chinese chargers and cables that don't bother to conform to any safety standards. There are tons of third-party chargers from reputable companies that I have never heard of causing any problems. In fact, if you go into any Apple store, you'll find a whole wall of third-party chargers  batteries, docks, car chargers. If Apple sells them directly, I think it's safe to say they aren't going to destroy your phone. Two, where are the 6ft cables from apple? They don't make any. How come this was never a problem with the 30-pin connector iPhones? What are you people doing with them? Playing jump rope? Hog-tying cattle? Yanking them out by the cable rather than pulling the plug itself out of the socket? I've had an iPhone 5 since shortly after they came out, have had only genuine Apple Lightning cables (3ft and 6ft) in the house and car, and have never had any of them stop working.